The word is defined as “a passionate expression of grief or sorrow.” Lamentations is a book in the Bible written by the prophet Jeremiah. Jeremiah suffered greatly as a prophet of God due to the wickedness of the Israelites of his day. They had walked away from God, and God was allowing them to suffer the consequences of their infidelity. I’d like you to read the entire chapter leading up to this verse. The prophet is talking about his sorrow and bitterness. Then, smack-dab in the middle of the chapter in the middle of the book, he reminds himself (as well as the reader) about God’s Faithfulness. In the middle of your trials, in the middle of your prayers do you find time to offer up praise and thanks? Lamentations 3 is a rich chapter. Anyone who is dealing with or has dealt with overwhelming sorrow will understand Jeremiah’s writing here. We can pour out our heartache to God, we can mourn for wrongs we have done and wrongs done against us; yet, like Jeremiah, we need to remember to give reverence to God and be thankful for having Him as our Lord and Father. No matter how bad things are we, as children of God, always have something to be thankful for. Always. I want you to think about the passage in Lamentations and the lyrics of the song this week. I will be doing a series of posts on this in the coming weeks in addition to our discussions on prayer. There is too much to be covered in one post! 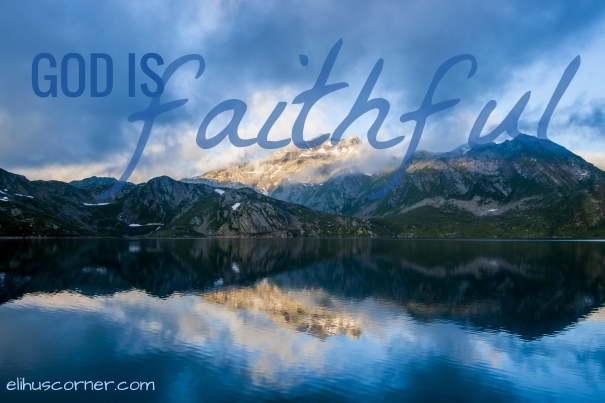 What reminds you of God’s faithfulness? Leave a comment below and share your thoughts! Be strong in the Lord, dear friends.